Instead of turning her son into an overweight and diabetic child with sweet rewards for good manners, she preferred to give him a new vinyl each week. Guts, an exemplary child, always finished his plate at the table and by age 9 was sitting on enough records to become the number one DJ in his neighbourhood. With an insatiable appetite for sound, his mother asks him to choose between studies and music. Guts begins work on the art of scratching and sampling. Soon he discovers New York’s old school gastronomy (EPMD, KRS One and the Public Enemy caviar). Looking deep into the Hip-Hop cauldron, he finally falls in, and creates the Alliance Ethnik in 1990. The first album takes Guts from a sandwicherie to a sous chef! Guts is good but needs more practice to further develop his technique. Bob Power (A Tribe Called Quest, The Roots) becomes his mentor and teaches him to how to correctly spice his preparations! He wins his American guide’s recognition and De La Soul, Rahzel, Biz Markie and Common Sense join him at the table. Next, Faster Jay opens the Kif Record label and Guts becomes one of his ‘chefs’, cooking beats for French rappers like Passi, Big Red, Sages Poetes De La Rue, the Svinkels, Les Rieurs. Always searching for new flavours, he travels to Senegal to learn new recipes at Youssou N’Dour studios and works with some local ‘chefs’ in Jamaica (Anthony B, Michael Rose and Sacha). 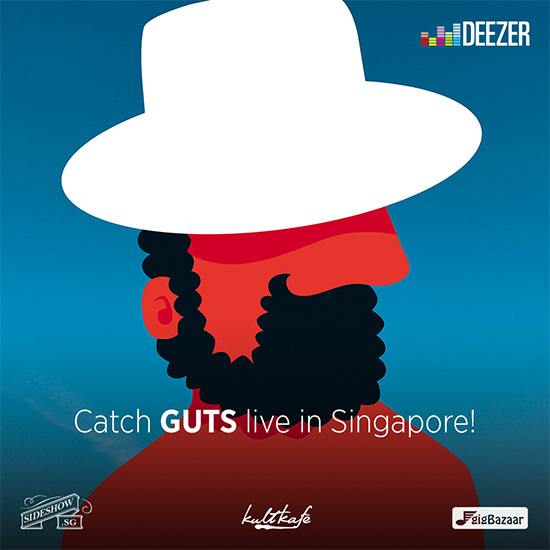 Now playing in Singapore for the first time – come enjoy Gut’s gourmet selection of beats with hints of Pete Rock, DJ Shadow, Dan The Automator, RJD2, DJ Premier, Jay-Dee, Danger Mouse and Wax Taylor – freshly prepared on a MPC 4000! Bon appetit!